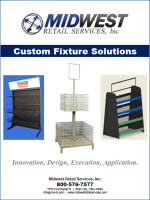 The goal at Midwest Retail Services is to match high quality retail fixtures to your merchandising vision through a unique blend of products and solutions. Finding the proper mix of retail fixtures for your store can be difficult. Bring your questions, retail fixture needs, or display problems to us and one of our industry specialists will pair you with the display fixtures that will best support your merchandising program. Whether you are opening a new retail business or updating fixtures across numerous outlets, we are dedicated to providing solutions to your merchandising challenges. Our industry expertise will provide attractive retail fixtures, gondola shelving, and merchandising accessories that support your retail success. Find out more about how Midwest Retail Services can help your program grow and succeed by calling 1-800-576-7577 or email us at info@mw-rs.com. Get quick catalog pricing on Lozier, Madix, and Streater gondola shelving with our Gondola Shelving Calculator. Simply use the fields below to choose the options that fit your specific requirements, and the product matches with pricing will instantly appear on the page. 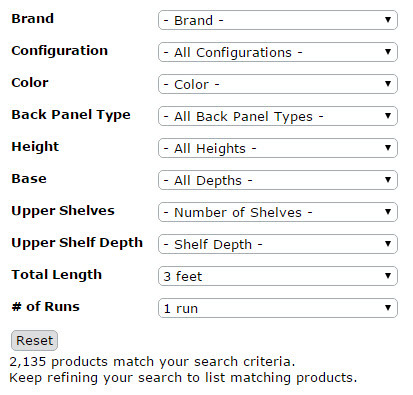 Click to try our FREE Gondola Shelving Calculator! Sometimes the myriad merchandising options available from major manufacturer isn't enough. Sometimes the answers to your retail display needs require a more creative and unique approach. Trust the experts at Midwest Retail Services to guide you through the often complicated process of crafting a custom solution to your biggest merchandising challenge. Browse our Custom Fixtures brochure to see our proven 5-step process which takes you gently by the hand and walks you through each stage from Concept to Fulfillment.